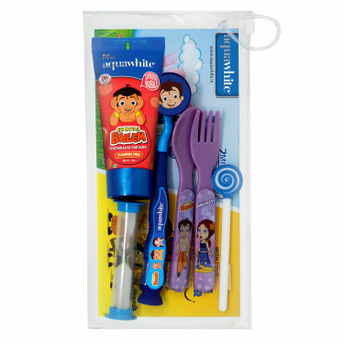 aquawhite Eat, Brush & Smile Chhota Bheem Dubble Bubble Gift Pack will make a perfect interactive birthday gift for your child. An exclusive license holder of Chhota Bheem characters in India, aquawhite ensures that this gift set helps your child maintain his/her overall well being. It is a fun filled gift pack that comes in a reusable zipper pouch (24 x 12 cm) for both boys and girls. This gift set also has a cool game printed on the card. aquawhite Chhota Bheem Dubble Bubble Toothpaste for Kids: Fluoride free toothpaste that’s safe for kids, even if they swallow it. Suitable for children from age 2-14 years. aquawhite Chhota Bheem Jiggle Wiggle Toothbrush: This toothbrush is made with Premium Soft DuPont Tynex Bristles which are gentle on kids teeth and gums. The suction cup that comes with it makes the brush stand upright and keeps the wet brush off the wall to reduce the potential of catching germs. Hygiene Cap with 2D Chhota Bheem & Chutki image: Hygiene cap protects the brush from getting contaminated. Lollipop Tongue Cleaner: Helps clean the tongue gently. The fun-design of the soft scraper will prompt the kids to use it regularly. (a) Two minute Sand Timer prompts them to brush for two minutes in the morning and night. (b) Images of your kid’s favourite character on the toothbrush and paste will make them brush two times a day. They will also ensure that the child is following a correct oral hygiene practice and the mothers are getting hassle-free mornings and nights. Chhota Bheem Spoon & Fork: Meal time has now become play time for your children! This spoon and fork set features printed character images of Chhota Bheem and friends that will keep the little ones intrigued and entertained.